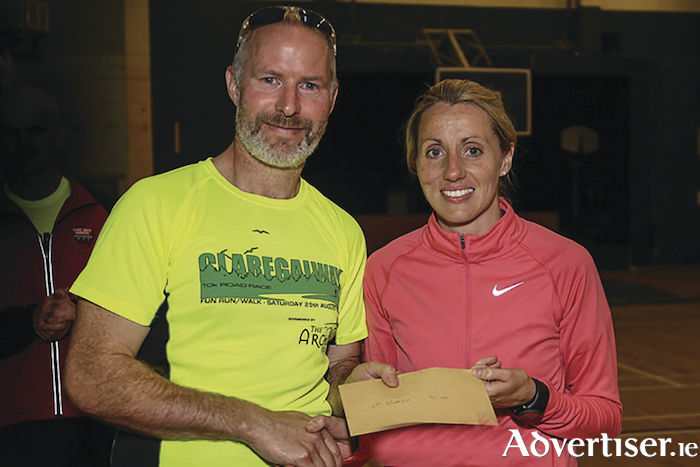 Brendan Dunleavy of The Arches Claregalway, main race sponsor, with winner Regina Casey. Top Irish international Mick Clohisey of Raheny Shamrock AC stormed home to win the 31st annual Claregalway 10k road-race on Saturday. Regina Casey of GCH was first woman in a fast time of 37.39, with Jane O'Leary of Ennis Track second in 39.49, and Sinead Foran of Athenry AC third home in 40.01. Some 200 athletes competed in the race, organised by Clare River Harriers AC, on a course which is now renowned as one of the fastest 10k circuits in the country. Many of Galway’s top Masters athletes travel to Malaga in Spain next week for the World Masters Track and Field championships. Ian Egan and Justin Lane of Tuam AC will both compete, as will Sean McDermott of Castlegar AC. The event will be held over two weeks from September 4 to 16.